US, UK, Saudi Arabia, Qatar, and Turkey stand accused of state sponsorship of terrorism. UN failure to enforce its own resolutions will resign their legitimacy, necessitate their expedient removal and replacement with multipolar system. The Libyan Islamic Fighting Group (LIFG) currently arming, funding, and commanding entire brigades of the so-called “Free Syrian Army” (FSA), is designated an Al Qaeda affiliate by the United Nations pursuant to resolutions 1267 (1999) and 1989 (2011), in addition to being listed by both the US State Department and the UK Home Office (page 5, .pdf) as a foreign terrorist organization and a proscribed terrorist organization respectively. Image: From UN.org – LIFG, who is now leading, arming, and funding (via Qatari, Saudi, Turkish, US, and British cash) entire brigades of the so-called “Free Syrian Army,” is clearly listed as an integral part of Al Qaeda, with the UN noting several prominent LIFG terrorists occupying the highest echelons of Al Qaeda’s command structure. These resolutions reflects other reports previously covered, including the US Army West Point Combating Terrorism Center report, “”Al-Qa’ida’s Foreign Fighters in Iraq” (summary here). …. This means that the United States, the UK, NATO, and the Gulf State despots of Saudi Arabia and Qatar are knowingly and willfully funding, arming, and politically backing designated affiliates of Al Qaeda contrary not only to US and British anti-terror legislation, but contrary to numerous UN resolutions as well. Western and Gulf State support of the FSA constitutes state sponsorship of terrorism. Image: In Libya – starting with the blue flak-jacketed Paul Conroy of the British press, standing to his left with a rifle slung across his chest is LIFG terrorist Mahdi al-Harati, now leading FSA brigades in Syria, to his left wearing green camouflage fatigues is Abdul Hakim Belhaj, LIFG commander who had visited the Turkish-Syrian border pledging weapons, cash, and fighters to FSA militants in November 2011. That same month, some 600 LIFG terrorists from Libya would enter Syria and begin militant operations. Al Qaeda was a creation of Western geopolitical interests, and to this day continues to serve these interests. The “War on Terror” is a fraud. Should the UN fail to enforce its own resolutions, while playing host to further sanctions and considerations for military intervention against the Syrian government who is in fact resisting an international terrorist organization, it will have entirely resigned its legitimacy and authority as nothing more than a tool of Western corporate-financier interests. It will also highlight the necessity to expediently remove and replace it – ideally with a system that represents a multipolar balance of global power maintained by sovereign nation-states rather than untenable supranational governance. The “Free Syrian Army”is Al Qaeda, led, armed, funded by Western-backed LIFG terrorists. 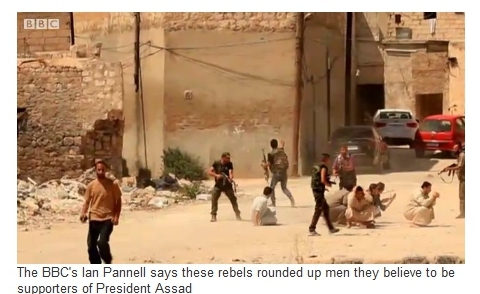 Image: From BBC’s Ian Pannell who also accompanied terrorists across the Turkish-Syrian border and into Aleppo, he reported young men “suspected” of being “Shabiha” being rounded up as the FSA “seeks revenge.” BBC fails categorically to explain how NATO-backed terrorists can “liberate” a city that is admittedly pro-government – but it appears it will be done through terrorism, brutality, mass murder, and intimidation. .
Clearly then, US, British, NATO, and Gulf State aid is being sent to the FSA whose ranks are admittedly filled by Al Qaeda. 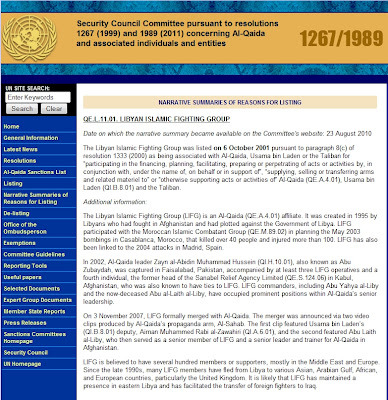 LIFG is also listed by both the US State Department and the UK Home Office (page 5, .pdf) as a foreign terrorist organization and a proscribed terrorist organization respectively. Foreign Policy’s admission of al-Harati’s role in organizing and leading the FSA in Syria, and the inclusion of Libyan terrorists in his brigade are by no means the only role LIFG is playing in the Syrian violence. LIFG commander Abdul Hakim Belhaj had visited the Turkish-Syrian border in late 2011 pledging Libyan arms, cash, and fighters to the FSA – with the nation of Libya itself having already become a NATO-created terrorist safe-haven. It is clear that LIFG, and by implication Al Qaeda, is playing a significant role in the violence in Syria, not only undermining the narrative of the unrest being an “indigenous” “pro-democracy uprising,” but also implicating foreign nations who are funding and arming militants as state sponsors of terrorism. Included amongst these state sponsors of international terrorism are Turkey, Saudi Arabia, Qatar, and the Hariri faction in northern Lebanon, as well as the NATO-installed government of Libya. This also includes both the United States, who is admittedly providing cash and equipment for the FSA as well as coordinating efforts to arm militants, and now the UK once again with their latest announcement. A similar scenario unfolded in Libya, where LIFG terrorists were likewise carrying out a campaign of nationwide genocide with NATO providing air support. Similarly, by funding, arming, and coordinating acts of violence with LIFG fighters, NATO, and in particular, France, England, and the United States, were guilty of violating both their own respective anti-terrorism legislation, as well as international provisions against terrorism.